Matthew Caruana Galizia is announced as one of the winners of the press awards. 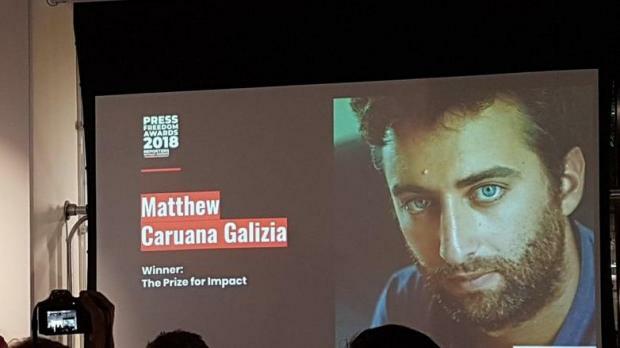 Maltese journalist Matthew Caruana Galizia won the Prize for Impact at the annual Press Freedom Awards held in London by Reporters Without Borders. Swati Chaturvedi from India won the Prize for Courage while Inday Espina-Varona from the Philippines won the Prize for Independence. The award to Caruana Galizia, the son of murdered journalist Daphne Caruana Galizia, was presented by Lindsey Hilsum, Channel 4 News’ Chief International Correspondent, and the biographer of war correspondent Marie Colvin, who was killed in Syria in 2012. The event was organised by Reporters Without Borders. The Prize for Impact was created to honour journalists, media or NGOs whose work has led to concrete improvement in journalistic freedom, independence and pluralism, or to an increase in awareness of these matters. Matthew Caruana Galizia worked at the International Consortium of Investigative Journalists (ICIJ) for five years and co-founded its Data and Research Unit. He has since worked tirelessly to obtain justice for his mother's murder and for the crimes she exposed, to galvanise the international community, and to hold the Maltese authorities to account, Reporters without Borders said. Pauline Adès-Mével, head of RSF's EU-Balkans desk, said: "Over the past year, Matthew Caruana Galizia has campaigned tirelessly for justice for the murder of his mother, journalist Daphne Caruana Galizia, and for justice to be rendered for all the crimes she exposed. He should take pride in having made a difference by showing another side of Malta, a small Mediterranean archipelago that, behind its tourist paradise facade, is plagued by corruption. We join Matthew's call for full justice for his mother, and hope this award will offer him support and protection for his valuable work." This year’s awards were selected by a high-profile international jury, including Nobel Peace Prize laureate Shirin Ebadi and Chinese activist Wu’er Kaixi - both RSF emeritus board members - as well as RSF President Pierre Haski. RSF’s UK advisory board - including Fleet Street legend Eve Pollard, former Director of BBC News James Harding, Channel 4 News Anchor Jon Snow, and media commentator Roy Greenslade - selected the winner of the special ‘L’esprit de RSF’ prize. 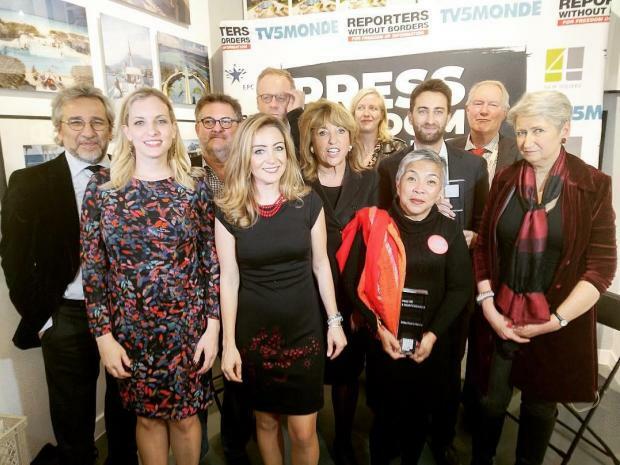 This year’s awards were made possible thanks to the generous support of TV5MONDE - a long-standing partner of RSF’s Press Freedom Awards - along with 4 New Square Solicitors, the European Publishers Council, and Heineken. RSF is grateful for these kind contributions.